We often talk about how these days, the recording processed is overly rushed and how “back in the day” we used to have the time to try things out, swap microphones and generally get it right “to tape”. The term “fix it in the mix” did not apply. Sometimes we might just resort to tried and tested method for getting a sound we like, and there is nothing wrong with this approach. However, what happens when you do have the time to “play” and try things out? 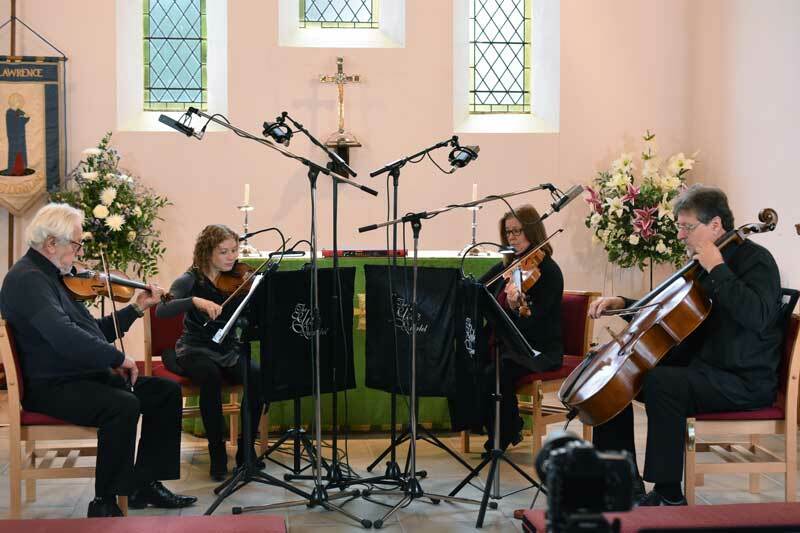 Well recently I was lucky enough to have the Elite String Quartet at my disposal for a day and a beautiful church to record them in, so, what you are going to see, hear and read about over a couple of articles over the coming weeks are some opportunities I took to try out some different microphones, some different recording rig solutions and some interesting recording techniques. Call it vogue, or even call it a fashion, but Ribbon mics are very much “the in thing” and recently I had the chance to try the two new Sontronics ribbons the Sigma II and Delta II. As a rule of thumb, I have found ribbon mics to give a very dark tone to recordings and they tend to work very well with acoustic instrument with harsh transients like woodwind and strings, and I think you can probably see where this is going. I made a call and managed to get 5 ribbon mics from our friends at Sontronics. On the violins I used the new Sigma II ribbon mic. The new Sigma II does not have the padding that it’s slightly tankier brother the Delta II has but hey, it’s not like I’m putting the mic up close to a guitar speaker cabinet. I placed the mics on boom stands just in front and over the players well out of reach of any stray bow movements. There is nothing worse than the perfect take ruined by the sudden clunk for the bow hitting the mic. You can see the Sigma II from the musicians point of view here. Even with it’s custom designed shock-mount the mic is not a big thing to have looming over head. Ribbon microphones, due to the physics of how they work all most always exhibit a figure of 8 pick-up pattern and the Delta II and Sigma II are no exceptions. This is not really an issue here as due to some careful placement there is nothing behind the mics to be picked up other than the lovely room tone. 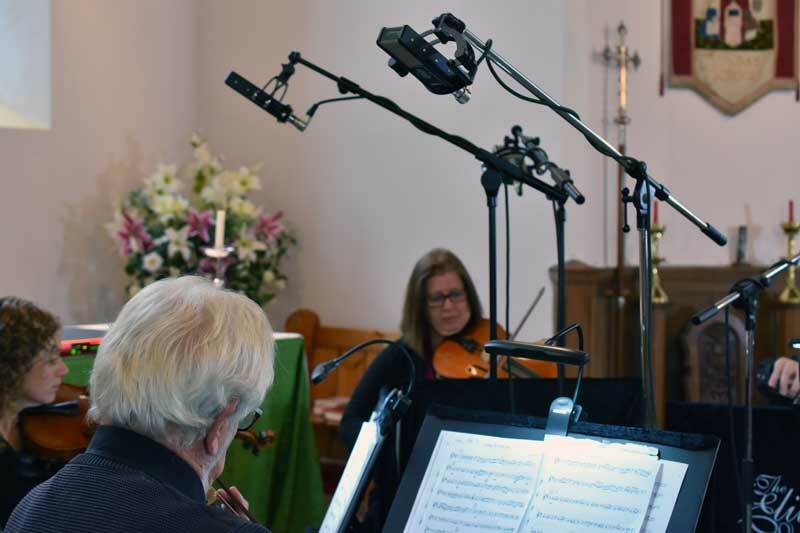 Both Viola and Cello are being recorded using the new Sontronics Delta II mic. This is normally a mic that I would put in front of Trumpet or a guitar speaker but hey, rules are made to be broken and all that. The new Delta II has the same ribbon element as the Sigma II it just has a lot more padding which makes it better at dealing with high sound pressure levels. So other than a little loss in sensitivity, the Delta II should have the same kind of tone to it as the Sigma II. Again the Delta II was placed above and a little in front of the players. Due to the way the Cello is played the mic is obviously lower. I tried to keep the all the mics the same distance from the sound holes in the instruments. Not that the sound of a “classical” stringed instrument comes from the sound or "‘f” holes but the idea was to keep the instruments and in turn the microphones equal distances apart to try to deal with any odd phase issues between the mics that might real their ugly heads. You can see in the image below how the musicians and microphones were arranged. In mixing then panned the mics to recreate the position of the players in the stereo field. As I said before I “made a call” one of the mics I managed to acquire was a brand spanking new Sontronics Apollo II stereo ribbon mic. I had never had a chance to try the original Apollo but I had heard very good things. Well when the microphone custodian at Abbey Road Studios says he likes a microphone, one tends to listen. The Apollo II is a dual ribbon mic and the ribbon elements are arranged at 90 degrees to each other 45 degrees off the centre axis. All this basically means that if you point the front of the mic at the sound source then you get a lovely stereo picture recorded from what is known as a Blumlein technique or Blumlein pair, named after Abbey Road recording engineer Alan Blumlein. The Apollo II room mic was set dead centre of musicians about 10 meters away from the players. Below you can hear three different mixes of the piece Tango Nuevo, Four Tango Postcards - No 1 by Benedikt Brydern performed by the Elite String Quartet. The first mix is the close mics only. This is a very up front sound. If I had not recorded the room using the stereo mic I’m sure I would be able to use some add some artificial reverb to make this work very well. The second mix is just the stereo Sontronics Apollo II room mic. The stereo image from this mic is stunning. The sound almost has a 360 degree feel to it. You almost feel enveloped by the natural reverb of the church. The third mix is a combination of both close and room mics. It’s almost a 50/50 mix of room to close mics, with no processing of any kind. No extra EQ or compression, just a little gentle limiting to bring the level up for the internet. I think you will agree the Sontronics ribbon mics give the recording a very nice dark tone. There is plenty of top end to the recordings, it’s not a dull sound but the tone is not bright or zingy (if that is a real world way to describe audio). Ribbon mics are very good at capturing a nice smooth warm version of the sound you hear especially on instruments that might be deemed harsh or hard sounding like Violins. This session (albeit with different musical examples) will be coming up again very soon as we tried a range of different types and arrangements of microphones and some different recording technologies during this one day recording. My thanks to the Elite Quartet for their patience and musicality on the day, watch this space there is much more coming. Vintage Ribbon Mics - Can Some Of The Modern Alternatives Deliver Comparable Results On Your Drum Recordings?